The new, liberal version of the Air Code adopted by the Turkmen parliament three years ago permits, among other things, private ownership of aircraft, airports, and other aviation-related infrastructure. This means a lot for the country whose only carrier, Turkmenistan Airlines, still remains under government control and more or less under direct supervision of Turkmenistan’s president, Gurbanguly Berdymukhamedov (we could not reach anyone at the airline for comment on the reportedly on-going privatization process – nor, indeed, for any comment at all). It was also in 2012 that Berdymukhamedov approved a civil aviation development program through to 2030, which is aimed, among other things, at boosting Turkmenistan’s appeal to foreign airlines. The program has already borne some interim fruit: in June 2015, freight specialist Cargolux launched transit flights out of Luxembourg with a stopover at Turkmenbashi International (the country’s second largest airport). Turkey’s low-fare airline Pegasus is planning to connect Turkmenbashi to Istanbul shortly. Turkmenistan Airlines is responsible for virtually all aviation-related operations in the country. First established in 1992, it has since completely renewed its Soviet-inherited fleet. 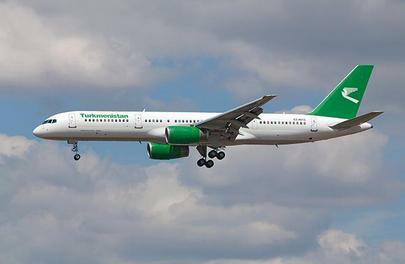 Turkmenistan Airlines currently operates over 20 Boeing passenger airliners on scheduled routes. Turkmenistan Airlines’ fleet expansion plans might result in purchases from manufacturers other than Boeing. The carrier is primarily interested in aircraft seating 50 to 100 passengers for its domestic routes. The airline has been looking at possible variants for several years: an ATR 42-600 is known to have made a marketing appearance in the country in 2013. Turkmenistan Airlines currently serves its domestic destinations with 120-seat Boeing 717-200s, a rarity elsewhere in the CIS. The carrier is mostly focused on serving the Turkmen market. It currently offers five domestic destinations from Ashgabat: Balkanabat (400 km from the capital city), Dashoguz (630 km), Mary (305 km), Turkmenabat (470 km), and Turkmenbashi (520 km). The airline carried nearly 1.9 million passengers in the first 10 months of 2015: 70% domestically and 30% internationally. The inflight magazine Lachyn (meaning falcon, which is also the carrier’s mascot) says Turkmenistan Airlines operates flights to 13 countries: Belarus (Minsk), China (Beijing), France (Paris), Germany (Frankfurt), India (Amritsar and New Delhi), Kazakhstan (Almaty), Latvia (Riga), Malaysia (Kuala Lumpur), Russia (Moscow and St. Petersburg), Thailand (Bangkok), Turkey (Ankara and Istanbul), the UAE (Dubai), and the UK (Birmingham and London). The Turkmen president is actively helping Turkmenistan Airlines with its route network expansion efforts. In the spring of 2013, he proposed to Andris Berzins, then president of Latvia, to launch flights to Riga. The idea at the time was for Turkmenistan Airlines to use Riga as a stopover for long-range flights, including to Toronto. The airline is still considering inaugurating routes to Canada, as well as to Georgia, Italy, Singapore, Vietnam, and other countries.